Paul's words are a blueprint for a healthy church. They tell us that church should be an inclusive community, embracing people from all walks of life. They also tell us that the church should be empowering individuals in the community to recognise their unique gifts and to use them effectively, for just as the human body cannot function at full capacity unless all its constituent parts are working together, so the church cannot truly live up to its calling unless the individuals within it are working together in the roles that God has equipped them for. In other words, the church community can thrive only when individuals sow into it with their time and talents. Not only that, individuals tend to feel more fulfilled when they are active participants in community life rather than simply passive observers. If you have been coming to C3 Mumbai regularly you will likely have heard about the Journey Series, our four-part course on the beliefs, values and culture of C3 Mumbai and the global C3 community. The Journey Series is designed to help you make C3 Mumbai your home and find your niche in the community. It is an open invitation to anybody who wants to be involved in what C3 Mumbai is doing. The course outlines C3 Mumbai's core beliefs. This is useful if you are starting out on your journey with Jesus or are simply exploring what Christianity is all about. It is also a great refresher for long-time believers — it is always good to get back to basics once in a while to remind ourselves of the fundamentals of Christ's message and why we believe what we believe. 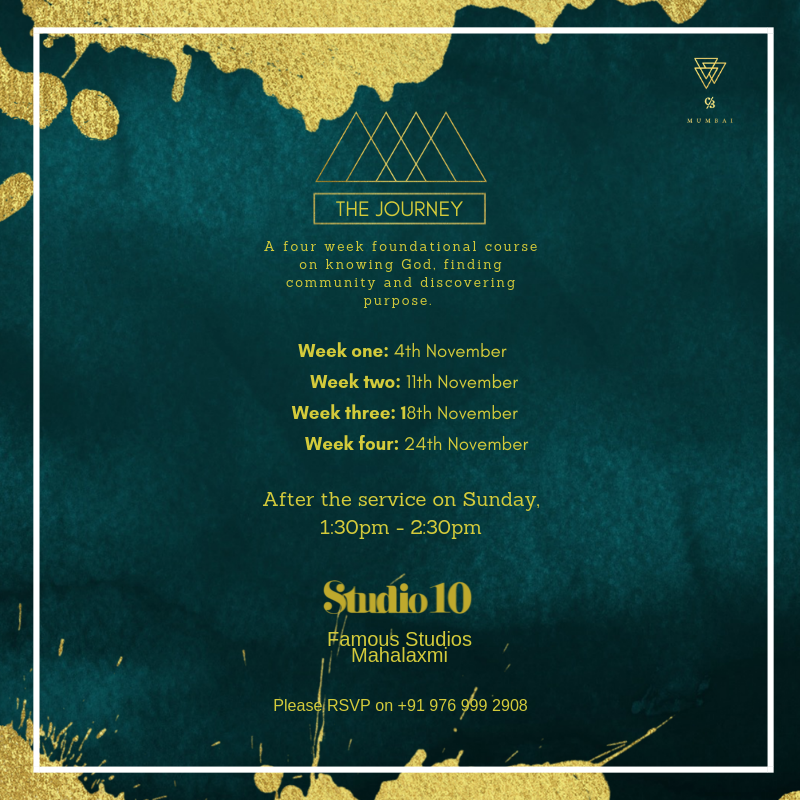 The Journey Series will also give you a good insight into the culture of C3 Mumbai as well as more practical matters such as how the church is funded and how it fits into the wider C3 community. If you have questions about the leadership structure of C3 Mumbai, who the leaders are accountable to, and what our vision is for this city, these will be addressed in the course. Lastly, the Journey Series will help you discover your spiritual gifts and how to make the most of them. For many people, this is one of the most exciting aspects of the course as it can reveal things about ourselves that we never knew before. The Journey Series is open to everybody. Whether you've been attending church for years or you've never heard Jesus' teachings before, you are welcome. Each session is conducted in a seminar format to encourage discussion and to allow you the chance to ask any questions you might have about the Christian faith and church life. That you can see your blessings, outnumber the sand beneath your feet. So you want to know what’s with our logo? Well click through to read this interesting article where we lay it all out for you. But he waited for me, like he always did. On 16 September 2018, one of our home-grown speakers Evelyn S gave a message on radical generosity. Evelyn have left us with three points to reflect on. I am very new to Christ, it's been a year and a half journey approximately getting to know Christianity is not about religion, but about relationship. My church in Mumbai has been significant in helping me develop this relationship. For me a few of my friends told me about this church, specifically. Although initially it was very sporadic. I could not attend every Sunday because of other commitments. Something really resonated when I was always there. When pastor Ryan spoke it really spoke to me. I used to feel many emotional pangs. The Bible is a fascinating book. By most estimates it is far and away the bestselling book of all time and its cultural impact cannot be overstated. It was authored by thirty-plus individuals from a variety of occupations and social backgrounds over a period of more than a thousand years. Within its pages we find historical narratives, legal documents, poetry, prophetic writings, proverbs, parables, pastoral letters, and more. Most of us spend the majority of our waking lives working. Some of us work a conventional 9-to-5 job, some of us are self-employed, some of us are voluntary workers, and some of us are stay-at-home parents. All of these roles are necessary for any society to function properly. But many people assume that pastors, priests, missionaries and other people in "godly" professions are doing more important work than those in "secular" professions. If you come to C3 Mumbai on Sundays or follow us online, you'll probably know that we recently celebrated our fifth birthday. It's a pretty significant milestone, and as we look back on the journey so far we can see God's grace and faithfulness at every step of the way.